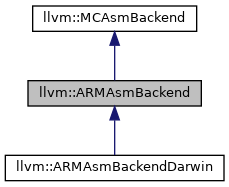 Definition at line 20 of file ARMAsmBackend.h. Definition at line 27 of file ARMAsmBackend.h. Definition at line 361 of file ARMAsmBackend.cpp. 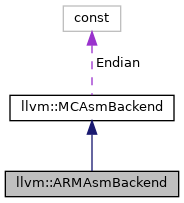 References assert(), llvm::ARM::fixup_arm_adr_pcrel_12, llvm::ARM::fixup_arm_blx, llvm::ARM::fixup_arm_condbl, llvm::ARM::fixup_arm_condbranch, llvm::ARM::fixup_arm_ldst_pcrel_12, llvm::ARM::fixup_arm_mod_imm, llvm::ARM::fixup_arm_movt_hi16, llvm::ARM::fixup_arm_movw_lo16, llvm::ARM::fixup_arm_pcrel_10, llvm::ARM::fixup_arm_pcrel_10_unscaled, llvm::ARM::fixup_arm_pcrel_9, llvm::ARM::fixup_arm_thumb_bcc, llvm::ARM::fixup_arm_thumb_bl, llvm::ARM::fixup_arm_thumb_blx, llvm::ARM::fixup_arm_thumb_br, llvm::ARM::fixup_arm_thumb_cb, llvm::ARM::fixup_arm_thumb_cp, llvm::ARM::fixup_arm_uncondbl, llvm::ARM::fixup_arm_uncondbranch, llvm::ARM::fixup_t2_adr_pcrel_12, llvm::ARM::fixup_t2_condbranch, llvm::ARM::fixup_t2_ldst_pcrel_12, llvm::ARM::fixup_t2_movt_hi16, llvm::ARM::fixup_t2_movw_lo16, llvm::ARM::fixup_t2_pcrel_10, llvm::ARM::fixup_t2_pcrel_9, llvm::ARM::fixup_t2_so_imm, llvm::ARM::fixup_t2_uncondbranch, llvm::ARM::fixup_thumb_adr_pcrel_10, llvm::FK_Data_1, llvm::FK_Data_2, llvm::FK_Data_4, llvm::FK_SecRel_2, llvm::FK_SecRel_4, llvm::MCSubtargetInfo::getFeatureBits(), llvm::MCFixup::getKind(), llvm::MCFixup::getLoc(), llvm::ARM_AM::getSOImmVal(), llvm::MCValue::getSymA(), llvm::ARM_AM::getT2SOImmVal(), llvm::MCSubtargetInfo::getTargetTriple(), llvm::MCFixup::getValue(), I, llvm::Triple::isOSBinFormatELF(), llvm::MCAssembler::isThumbFunc(), joinHalfWords(), llvm::support::little, LLVM_FALLTHROUGH, llvm::MCContext::reportError(), swapHalfWords(), and llvm::MCSymbolRefExpr::VK_TLSCALL. Definition at line 902 of file ARMAsmBackend.cpp. References adjustFixupValue(), assert(), llvm::support::big, llvm::MCAssembler::getContext(), getFixupKindContainerSizeBytes(), getFixupKindNumBytes(), llvm::MCFixup::getKind(), llvm::MCFixup::getOffset(), llvm::support::little, and llvm::ArrayRef< T >::size(). Definition at line 258 of file ARMAsmBackend.cpp. Definition at line 49 of file ARMAsmBackend.cpp. References assert(), llvm::FirstTargetFixupKind, llvm::MCFixupKindInfo::FKF_IsAlignedDownTo32Bits, llvm::MCFixupKindInfo::FKF_IsPCRel, llvm::MCAsmBackend::getFixupKindInfo(), llvm::support::little, and llvm::ARM::NumTargetFixupKinds. Definition at line 32 of file ARMAsmBackend.h. Definition at line 74 of file ARMAsmBackend.h. Definition at line 175 of file ARMAsmBackend.cpp. Definition at line 162 of file ARMAsmBackend.cpp. Definition at line 38 of file ARMAsmBackend.h. References adjustFixupValue(), applyFixup(), llvm::HexStyle::Asm, llvm::Data, Fixup, fixupNeedsRelaxation(), llvm::MCSubtargetInfo::getFeatureBits(), getFixupKindInfo(), getRelaxedOpcode(), handleAssemblerFlag(), mayNeedRelaxation(), reasonForFixupRelaxation(), relaxInstruction(), shouldForceRelocation(), and writeNopData(). Definition at line 75 of file ARMAsmBackend.h. Definition at line 198 of file ARMAsmBackend.cpp. Definition at line 205 of file ARMAsmBackend.cpp. References llvm::ARM::fixup_arm_thumb_bcc, llvm::ARM::fixup_arm_thumb_br, llvm::ARM::fixup_arm_thumb_cb, llvm::ARM::fixup_arm_thumb_cp, llvm::ARM::fixup_thumb_adr_pcrel_10, llvm::MCFixup::getKind(), and llvm_unreachable. Definition at line 264 of file ARMAsmBackend.cpp. References llvm::MCInst::addOperand(), llvm::MCOperand::createImm(), llvm::MCOperand::createReg(), llvm::MCInst::dump_pretty(), llvm::MCInst::getOpcode(), getRelaxedOpcode(), llvm::report_fatal_error(), llvm::MCInst::setOpcode(), and llvm::raw_svector_ostream::str(). Definition at line 76 of file ARMAsmBackend.h. Definition at line 758 of file ARMAsmBackend.cpp. References assert(), llvm::ARM::fixup_arm_blx, llvm::ARM::fixup_arm_condbl, llvm::ARM::fixup_arm_thumb_bl, llvm::ARM::fixup_arm_thumb_blx, llvm::ARM::fixup_arm_thumb_br, llvm::ARM::fixup_arm_uncondbl, llvm::ARM::fixup_arm_uncondbranch, llvm::ARM::fixup_t2_condbranch, llvm::ARM::fixup_t2_uncondbranch, llvm::FixupKind(), llvm::MCFixup::getKind(), llvm::MCValue::getSymA(), llvm::MCSymbolRefExpr::getSymbol(), getType(), llvm::MCSymbol::isELF(), llvm::MCSymbol::isExternal(), llvm::MCAssembler::isThumbFunc(), llvm::ELF::STT_FUNC, and llvm::ELF::STT_GNU_IFUNC. Definition at line 295 of file ARMAsmBackend.cpp. References isThumb(), llvm::support::endian::write(), and llvm::raw_ostream::write().